After eight-and-a-half years, just as Lyn had decided to leave and was beginning to plan her exit, Cec became seriously ill. Almost overnight Lyn found herself in the role of caregiver at Cec’s hospital bedside. “Lyn’s a terrible nurse,” Cec would tell visitors and Lyn knew she was right. Lyn was awkward and jumpy, her timing invariably wrong. She felt trapped, and furious at having to stay, guilty for wanting to flee. Lyn spent long days and nights at Cec’s bedside, imagining how death would come and contemplating a relationship gone wrong. “Impossible to set this right,” Lyn thought, as she lay curled on a small cot in Cec’s room. One last time Cec surprised her. 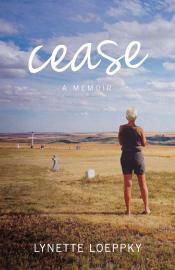 Cease is a blunt and honest account of experiences that are usually kept hidden. Told with a frank and intimate voice, Cease offers an unsentimental look at the inner workings of a uniquely difficult relationship that is revealed for what it is – more human than strange. The Writers' Trust Jury Citation for Lynette Loeppky's "Cease"